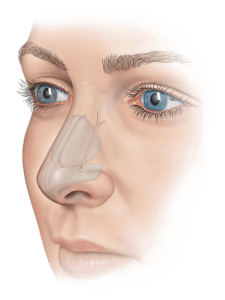 The LATERA Absorbable Nasal Implant is used to support upper and lower lateral cartilage in the nose, reinforcing the nasal wall like traditional cartilage and polymer grafts. Supporting the cartilage in this manner may reduce nasal airway obstruction symptoms and help patients breathe better. The technology is intuitive to learn and use, and is delivered inside the nasal wall by Ear, Nose & Throat surgeons. Other risks related to the LATERA implant included: discomfort, infection, reaction to material, and device retrieval.